This guide describes how to automatically load balance between two or more origin servers. Load balancing distributes requests across multiple servers to optimize resource use and avoid overloading any single resource. To prevent errors when shielding is enabled, all backends in the automatic load balancing group must use the same shielding location. Conditions on your origin server can directly change how automatic load balancing behaves. Be sure to review conditions behavior to ensure automatic load balancing works properly. Many customers configure failover at the same time they configure load balancing functionality. Our guide on configuring failover can show you how. From the Auto load balance menu, select Yes. In the Weight field, type the percentage of the total traffic to send to the origin server. TIP: When you specify a whole number in the Weight field, you specify the percentage of the total traffic to send to a specific origin server. Each origin server receives the percentage (<weight>/<total>) of the total traffic equal to the number you specify. For example, if you have two origin servers, A and B, setting the weight to 50 on both splits the traffic between them equally. Each origin server receives 50 percent of your total traffic. If you increase the weight on origin server A to 55 and decrease the weight on origin server B to 45, the percentage of traffic changes to 55 percent and 45 percent respectively. Repeat steps 5, 6, 7, and 8 for each origin server you want to include in the automatic load balancing group. You can set conditions on origin servers or headers to change how load balancing works. When you set conditions on origin servers, you can potentially change how automatic load balancing works. The load balancing autodirector groups servers together based on like conditions, giving you the flexibility to effectively create subsets of the autodirector by assigning a condition to one group of origins and another condition to another set of origins. If each group of origin servers has a different condition that affects load balancing, the auto load function will not randomly load balance between the different servers. 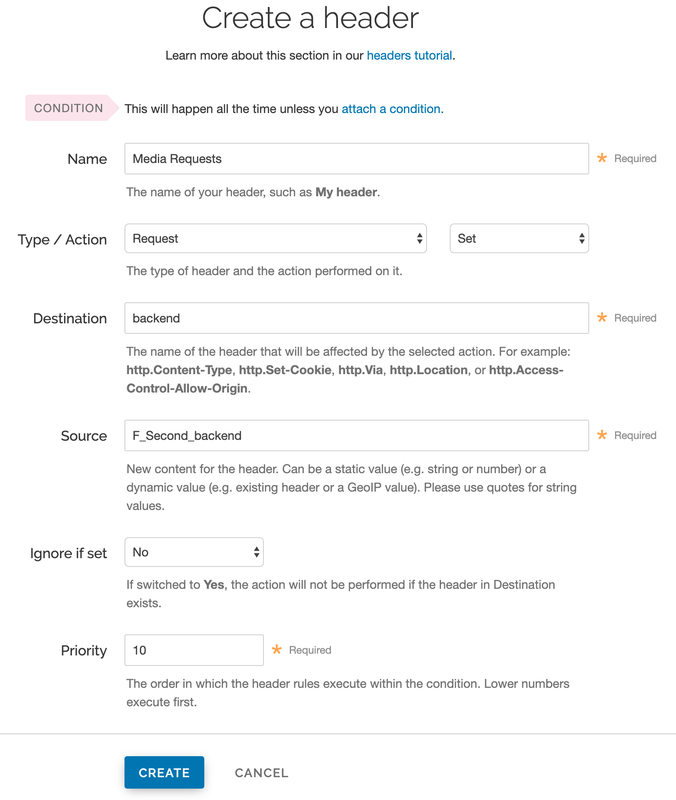 Conditions can also be assigned to a server through a header. For example, you have three servers called F_Fastly, F_Second_backend, and F_Third_backend and want all URLs with a certain prefix to default to the second server. First, you'd create a header. In the Name field, type a descriptive name for the new header (for example, Media Requests). From the Type menu, select Request and from the Action menu, select Set. In the Destination field, type the name of the header that will be affected by the action (for example, backend). In the Source field, type the name of the origin server the content for this header comes from (for example, F_Second_backend). After the header is created, you'd create a new condition to apply if the URL matches the desired prefix. In the Name field, type a descriptive name for the new condition (for example, Media Files). 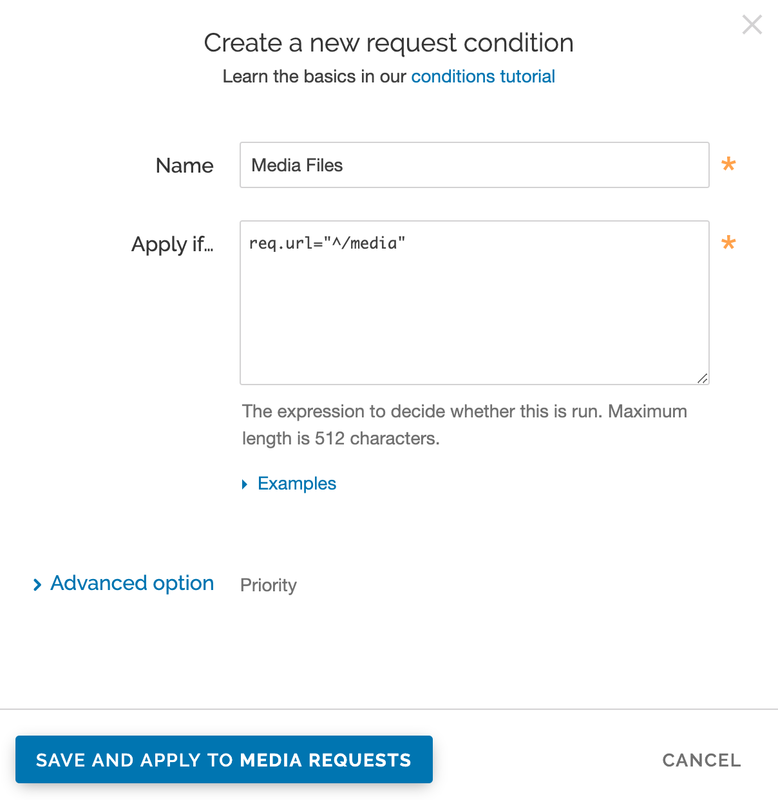 In the Apply if field, type the request condition that will be applied (for example, req.url="^/media"). The generated VCL below illustrates the autodirector set for all three servers. Within the section sub vcl_recv, the default origin server is set to the autodirector and, if the media condition is met, requests are forwarded to the second server. If the condition is not met, requests are forwarded to one of the three servers at random.